I've written before on Pudding Lane about my love for all things Ottolenghi. 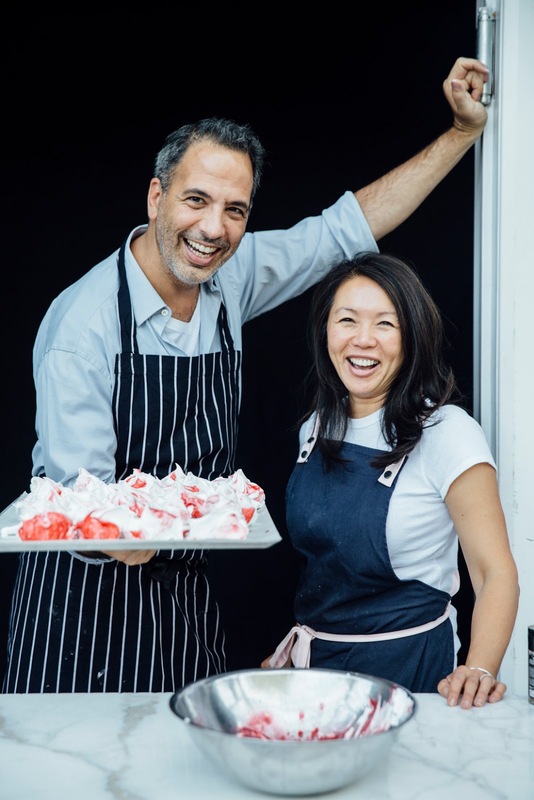 By 'all things', I mean of course that Ottolenghi is synonymous with much more than just Yotam Ottolenghi himself - he is restaurants, he is cookbooks, he is piles of cloud-like pastel meringues and tray upon tray of perfectly sweet morsels, almost too pretty to eat. But eat them we do, because Ottolenghi's creations are more than a little bit magic. They inspire joy and indulgence while perfectly balancing the natural acidity and bitterness of seasonal produce with a lightness of touch that - in my humble opinion - very few can muster. Four years a Londoner, and I still know of few joys more special than leaving Ottolenghi on Upper Street with a weighty white box of sweet treats dangling from my wrist. And as for the man himself? Well, my mind was made up when I listened to Yotam's Desert Island Discs and he chose a lemon tree as his one luxury on a desert island. A man after my own heart, it would seem. And so you can imagine my delight when Yotam and Helen's team sent me a copy of their gorgeous new creation, SWEET. This is the book which, I suspect, many Ottolenghi fans have been waiting for - finally, it's time for dessert. Written in collaboration with the venerable Helen Goh, SWEET has over 100 gorgeous recipes which I cannot wait to try. For now, I bring you Yotam and Helen's recipe for sweet little blackberry and star anise friands. A quintessentially Ottolenghi treat, perfect for Autumn. Preheat the oven to 220°C/200°C Fan/Gas Mark 7. Brush the 12 holes of a regular muffin tin with the melted butter and sprinkle all over with flour. Tap the tray gently to ensure an even coating of the flour, then turn upside down to remove the excess. Place in the fridge to chill while you make the batter. To brown the butter, place in a small saucepan and cook over a medium heat until melted. Continue to cook until the butter is foaming, gently swirling the pan from time to time, to allow the solids to brown more evenly. You will see dark brown sediments begin to form on the sides and bottom of the pan. Continue to allow the butter to bubble away until it turns a rich golden brown and smells of toasted nuts and caramel. Remove the pan from the heat and let it stand for 5 minutes, to allow the burnt solids to collect at the bottom of the pan. Strain through a fine-mesh (or muslin- lined) sieve, discarding the solids. Allow the browned butter to cool slightly before using. It should still be warm when folding into the mix later: if it is too hot, it will ‘cook’ the egg whites; if it is too cool, it will be difficult to incorporate into the mix. While the butter is cooling, sift the flour, icing sugar, ground almonds, star anise and salt into a bowl. Place the egg whites in a small bowl and use a whisk or fork to froth them up for a few seconds – you do not need to whisk them completely. Pour the egg whites into the sifted dry ingredients and stir until they are incorporated. Add the orange zest and browned butter and mix until the batter is smooth. Remove the muffin tin from the fridge and fill the moulds just over two-thirds of the way up the sides. Place three halved blackberries on top, cut side down, and bake for 10 minutes. Reduce the temperature to 210°C/190°C Fan/Gas Mark 6 – starting with a high oven temperature and then bringing it down is the way to achieve the lovely brown crust you want – turn the tray around in the oven for even cooking, and continue to cook for another 8 minutes, until the edges of the friands are golden brown and the centres have a slight peak and spring back when gently prodded. Set aside to cool before removing them from their moulds: you might need to use a small knife to help you release the sides. If you are icing the cakes, place 60g of blackberries in a small bowl with the water and lemon juice. Use a fork to mash them together, then pass the mixture through a fine-mesh sieve to extract as much fruit juice as possible: you should get about 60ml. 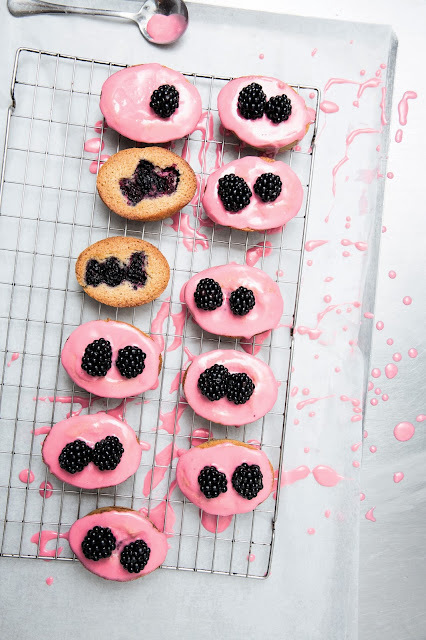 Sift the icing sugar into a medium bowl, pour in the blackberry juice and combine to make a light purple runny icing: it should just be thick enough to form a thin glaze on the tops of the cakes. Spoon the icing over the cakes, spreading it to the edges so that it runs down the sides. Do this on a rack, if you can, as icing them on a plate or sheet of paper means that the icing will pool at the bottom. Place 2 small blackberries on each friand, set aside for 20 or 30 minutes to set, then serve. Recipe taken from Sweet by Yotam Ottolenghi and Helen Goh (Ebury Press, £27) Photography by Peden + Munk. I was lucky enough to recipe a press copy of this book but all views are - as always - entirely my own. Buy your copy HERE!